The studio will be closed on the following days: April 11-26 2019. Enjoy your days off! An Introduction to Pilates – Training that’s Fun! We are excited to announce our new class in Barbara Schultes Physiotherapy Practice. helps develop an awareness of posture habits. Pilates for Beginners creates a solid training base for all newcomers. This class also is good for people that are recovering from sickness and helps with injury rehabilitation. Train regularly and say goodbye to back pain. Exclusive Pilates and Yoga Retreat in Morocco. Explore Marrakech. Discover your Body. Deepen your Pilates and Yoga practice in a breathtaking environment. In the luxury of a 5 Star Riad we will be practicing Yoga and Pilates Intensive classes. During the daytime explore this magical and overwhelming city, taste Moroccan spices and delicacies, enjoy the Hammam, relax with a massage, take a cooking course, discover the famous mint tea and reconnect with your body. Weather permitting, all classes will be held during Sunrise and Sunset on the rooftop terrace in the cozy charm of the Riad. 4 Nights/5 days in the exclusive Angsana Riads Collection, 10 Sessions of Pilates and Yoga, and Breakfast included. Flights, Private Transfer to/from airport Marrakech to Riad on request. Although scientists and doctors have not yet found a cure for Multiple Sclerosis, research indicates that a regular Pilates practice can help manage many of its symptoms such as foot-drop, posture, balance, bladder, fatigue and memory. Pilates is low impact and is suitable for all levels of mobility. Practitioners say regular Pilates practice can help improve posture, muscle tone, balance and joint mobility, as well as relieve stress and tension. provides support, challenge and resistance. Elements of pilates, yoga and dance are woven together for a class that focuses on mindful movement. Expect a community of camaraderie, laughter, fun and of course hard work. Neurological Conditions with specialization in MS, Parkinsons and Stroke. Class is on Saturdays 12:30-13:25. Register online through the MindBody system. If there are any questions if this is the right course for you, please do not hesitate to call! 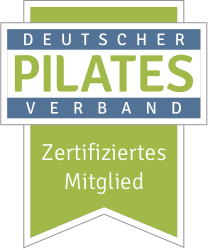 Hannah is the first person in Germany to attain an advanced pilates and fitness certificate specializing in Neurological Conditions with emphasis on Multiple Sclerosis, Parkinsons Disease and Stroke. How does that effect you? Science’s growing understanding of Neuroplasticity has changed the way we understand movement for both professionals and exercisers alike. Neuroplasticity is the brain’s ability to reorganize itself by forming new neural connections throughout life. Even if you do not have a neurological condition or brain injury, the theories have already been integrated into your classes making your class experience even richer. Harnessing the power of the mind-body connection can improve the performance of any student or athlete. Christian and Hannah both hold certificates in Pre and Post pregnancy pilates. What does this mean for you? Because of the high number of women that attend our studio, we are able to offer safe classes throughout pregnancy that keeps Mommy and Baby fit and active. Benefits include strengthening stomach and gluteal muscles, reducing back pain, strengthening pelvic floor, improving balance, strengthening legs, maintaining healthy weight, avoiding/repairing Diastasis Recti and reducing stress. Even for our athletes that are not pregnant, I think we can all agree that these benefits sound good! Hannah and Christian hold an Advanced Pilates for Dancers Certificate from Karen Clippinger. And, they were the first in Germany to attain a certificate in Progressing Ballet Technique. Both of these educations help elite and hobby dancers alike access their dance technique more efficiently which reduces the danger of injury. Even if you have never danced a step in your life, these ideas have already been integrated into your classes strengthening your knee joints, Hips, core muscles and ankles to help you function with ease and grace. Those of you who trained with us before your ski season may have already recognized that you were less sore, had more leg muscle endurance and better balance. Coincidence? The application of this knowledge helps us to rectify imbalances and asymmetries. The idea of “re-balance, release and re-connect” is good for us all. Feel free to ask about any of our other workshops! “but Pilates is for Ladies…” Actually Pilates was designed by a man for men. Joseph Pilates, professional boxer and weightlifter, developed his method as a way to build strength, flexibility, mental focus and control of the body. Now everyone from hobby athletes, professional athletes to those whom are new to sports can enjoy the benefits. So, why Men Pilates? This class will be focusing on core strength, flexibility, balance, uniform muscle development and efficient movement patterns. Instead of just powering through your workout Christian helps to find the strength, length, and elasticity in your muscles. Saturdays at 10am with Christian. Take a look into the studio with Nürnberger Nachrichten. Click here to access the article from NN and a short video. Or enjoy this video below from BR Franken (in German) about our Pilates for Men class! Need some help getting your nutrition back on track? Im glad to continue the partnership with Dr. Megan Mitchell. Her whole body wellness approach can help you feel great in your own skin. Catch her taking classes at here at PFP or find her at www.meganmitchell.net or megan@meganmitchell.net. The studio will be closed on the following days: April 11-26 Easter Break, May 1 Tag der Arbeit, May 30 Christi Himmelfahrt, May 31-June 14th Yoga Teacher Trainer Retreat, June 20th Frohnleichnam, July 11-14, August 3-11 Summer Break, October 1-6 Retreat Marrakech, November 1 Allerheiligen. Enjoy your days off! Since 2016, Performance Fit Pilates is a Partner of the Nuremberg Ballet. We would like to wish the Ballet a successful season 2018/2019 and look forward to seeing you in our Studio. Start here. Create your personal profile to get started! Be YOUR best you! I am excited to announce that we are using MindBody online in order to make your class scheduling easier. You can now schedule group classes, book personal training appointments, change appointments, cancel and pay online from here. Create your personal profile to get started! Be YOUR best you! In this class we will be using the floor mats, the pilates circle, thera-bands, exercise balls, and/or weights as we train the whole body. The Pilates HIIT class is a combination of pilates exercises and High Intensity Interval Training. This workout will raise your heart rate, challenge your body and mind in a team environment. It is a class designed to take the best ballet exercises and make them accessible so everyone has the possibility of training like a ballet dancer. This class is an integration of Asanas (Postures) from several disciplines of Yoga and my personal yoga practice. The focus is on proper alignment, awareness through movement and breathing. Artistry, musicality and rhythm are learned through ballet technique as we develop long, strong muscles, flexibility and better posture. © 2019 Performance Fit Pilates All Rights Reserved. Subscribe to our newsletter and join us! Melde dich an und bleibe auf dem neuesten Stand.